How do I customize the look and feel of my organization's Submittable site? We encourage you to personalize the look and feel of your submission form by uploading a header image containing your organization's name and/or logo and by customizing your submission form's colors, font, and button text. Please Note: Only Level 5 team members have the ability to customize the look and feel of an organization's Submittable site. Click on the More menu in the upper right corner of the screen. Select Configurations. Then select Look & Feel on the left hand side of the screen. In the Header Image section, click Select Image and choose the file you'd like to upload from your computer. Your image will appear in the selection box shown here. Our maximum recommended file size is 982 px wide by 220 px high, for best results your header image should be at least 400 x 90. Files are automatically resized if needed. Accepted file types are PNG, GIF, and JPG. After you upload your image, you will have the option to crop it. To crop your header, grab any corner of the active perimeter and drag it inward. You can grab any edge of the active perimeter and move your cropped area around to place it where you want. When you have finished cropping your image, click Save Image. Or if you decide not to crop it, click Save Image Without Cropping. Click Cancel to reset the dialog and upload a different image. In the Page Styles section, choose your preferred colors, font type, and button text. All colors must be entered using hexadecimal values, or you can click on the blank box next to each style form and use our popup color picker. 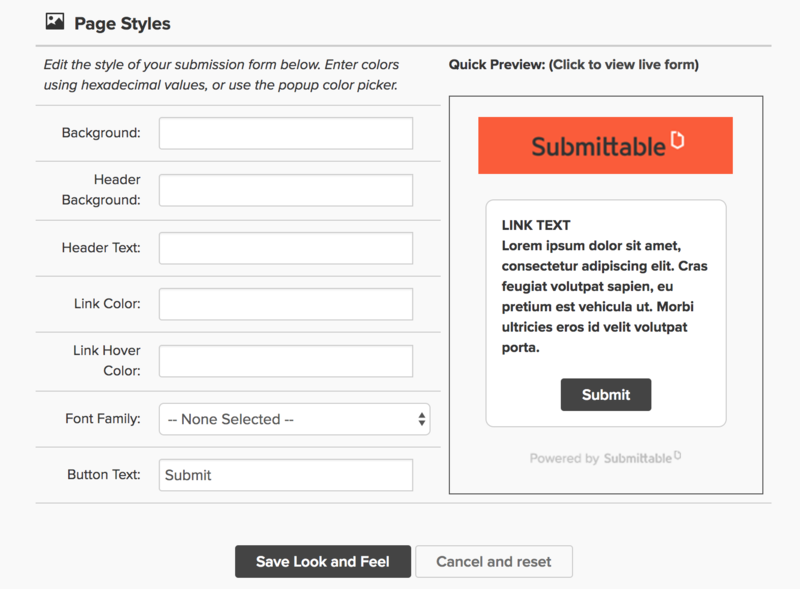 As you make your selections, the Quick Preview box will show a sneak peek of what your submission form will look like. Click Save Look and Feel. To clear and reset your selections, click Cancel and reset.